We’re excited to announce new Project Organizer features to make it even easier to get insight into your projects’ progress quickly, easily and automatically. It’s always been simple to keep track of the status of your creative projects with inMotion – Now you can get even more visibility into the progress of your projects with inMotion’s new Taskometer! 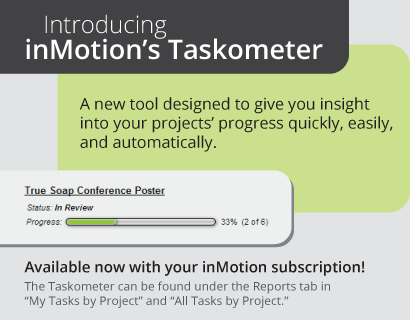 With Taskometer you can monitor in a glance how close your project is to completion. This new tool replaces cumbersome Gantt charts that require too much administrative overhead to setup and update. We’ve also added a new “Project Tasks by User” report under the Reports tab, giving you an overview of what each of your team members are working on so you can more easily allocate resources. Plus, it’s now even easier to share project reports, with one-click options to email reports or save them as a document or spreadsheet – great for bringing to meetings and printing to-do lists. These enhancements are complimentary with your inMotion subscription. If you have any questions, contact your Success Manager or post them in the comments.